Experience rural Colorado in comfort and luxury, wherever your adventure takes you. Fantastic views and elegant living in this secluded and unique rental, just 5 minutes drive from Crestone. This open plan rental includes a king bed, a loft with a queen bed, bathroom, living area, and full kitchen. Tucked away in the woods a short walk from downtown Crestone, the Tree House offers seclusion and convenience. This rental offers two queen beds with private rooms, a full kitchen, a cozy living room, lovely bath, and elegant dining space. Located in downtown Crestone, the penthouse is the ultimate hotel room. On the second floor of the Bliss Inn, the penthouse features a 6-foot tub, king bed, full kitchen, living area, private deck, and dining space. Next door to its sister dome, the Beautiful Dome offers seclusion, views, a king bed, pullout sofa, full kitchen and dining space. A perfect rental for romantic getaways and special occasions. Nestled in the woods outside of downtown Crestone, this rental offers cozy home furnishings with hotel quality. The Woodstock rental offers a private bedroom, full kitchen, bathroom, and ample living space. Keep it simple with one of our traditional hotel rooms, the Bliss Inn suites. Still fully loaded with a small kitchenette, huge shower, and central location in downtown Crestone. Located a minute's walk from downtown Crestone, with amazing views of the mountains and the valley. The Studio rental features a queen bed, kitchenette, dining area, bathroom, and sound-proof bliss! 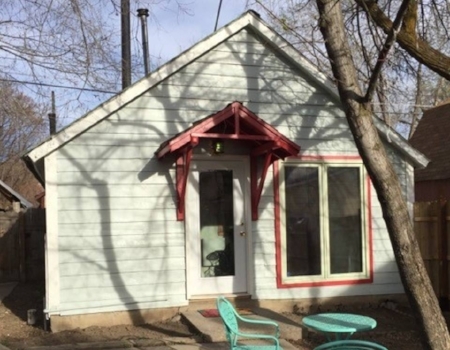 Within two blocks of dowtown Paonia, this adorable little cabin is what we call the 'tiny home mansion'. This 333 square foot cabin includes a lush living area, queen bed, and kitchen with petite dining area.